Meanwhile, the status of Abyei, a region immediately west of Unity state, remains disputed by both Sudan and South Sudan. 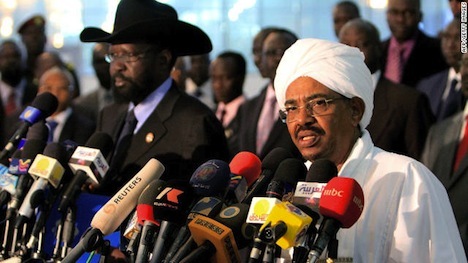 It’s not difficult to imagine that Omar al-Bashir (pictured above, right, with Kiir) could take advantage of a drawn-out civil war in South Sudan by moving to take control of Abyei, despite the latest indication that the vast majority of Abyei’s residents preferred in an October 2013 non-binding referendum to become part of South Sudan. Abyei’s fate is connected to a revolt in South Kordofan, a state that lies just north of the Sudan-South Sudan border — while both countries agreed that it would remain under Khartoum’s administration, many of its inhabitants identify with South Sudan, and Bashir has been engaged in a two-year local rebellion to retain control of South Kordofan. Given that South Sudan’s oil travels north through pipelines in Sudan to the Red Sea, and given that civil war would likely send an influx of refugees northward, Bashir would have a least a prima facie case for intervention on behalf of Sudan’s own stability — and a fig leaf for conceivably invading Unity or Upper Nile states for the purpose of ‘securing’ the oil wells during a civil war. While Ethiopia and Kenya have assumed the highest profile over the past two weeks in brokering a South Sudanese peace, Sudan’s role will not be insignificant for South Sudan’s future. It’s all the more tragic given that Khartoum played more than a passing role in the current divisions between Machar and Kiir — when Machar first rebelled against the leadership of John Garang in what was then the Sudan People’s Liberation Army (SPLA), Machar played a role in a controversial 1991 massacre in Bor, a strategic city in South Sudan, and he signed an even more controversial peace deal with Bashir in 1997 that allied himself with northern forces against Garang, Kiir and the SPLA. Machar ultimately reunited with the SPLA in 2002 and fought alongside Kiir throughout the ensuing decade through South Sudan’s independence (the charismatic Garang died in an unfortunate 2005 plane crash). Southern Sudan spent nearly 40 out of 50 years in a state of civil war against Khartoum. When independence came in 2011, it marked a difficult transition point for Kiir, Machar and the SPLM from making war to making government. Without the imminent northern enemy to unite them, it’s been hauntingly easy over the past two weeks for Kiir and Machar to slip back into making war. But in doing so, South Sudan risks losing what little it has that could make it a viable independent state.